Mother Tina and son Luke are both graduating from the university this May. 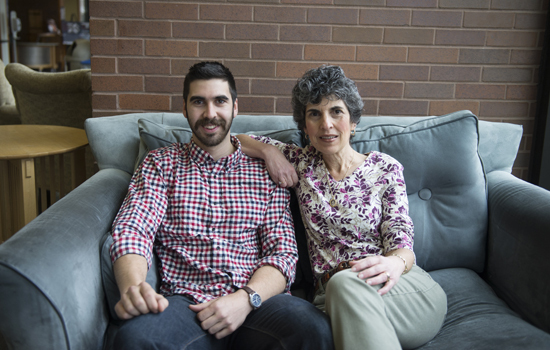 Santina “Tina” McKean says when she walks on the RIT campus she is a “regular student, not Luke’s mom”—although both mother and son are both graduating from the university this May. It took six long years for Tina, a mother of three from Scottsville, N.Y., to complete her MBA degree at Saunders College of Business—taking one class at a time while working as a marketing manager at PCB Piezotronics, and previously at ORMEC Systems. She said she came to RIT “first”—before Luke began pursuing his mechanical engineering degree at Kate Gleason College of Engineering. But in reality, her husband, Christopher, was ahead of both, earning an MS degree in manufacturing and mechanical systems integration in 2003. “During the MBA student orientation in 2010, I quickly figured out that my computer science degree from 1981 was older than my counterparts’ ages,” said Tina. “I admit I was prejudiced regarding these young millennials; what could they know after their undergraduate studies? “I’m impressed with the rigor and high standards of RIT and am excited to be graduating this May,” said Tina. “The fact that my son Luke is getting his mechanical engineering degree at the same time is icing on the cake and the McKean household is having a big graduation celebration."